Mosaic knitting may be the most unknown form of colorwork. 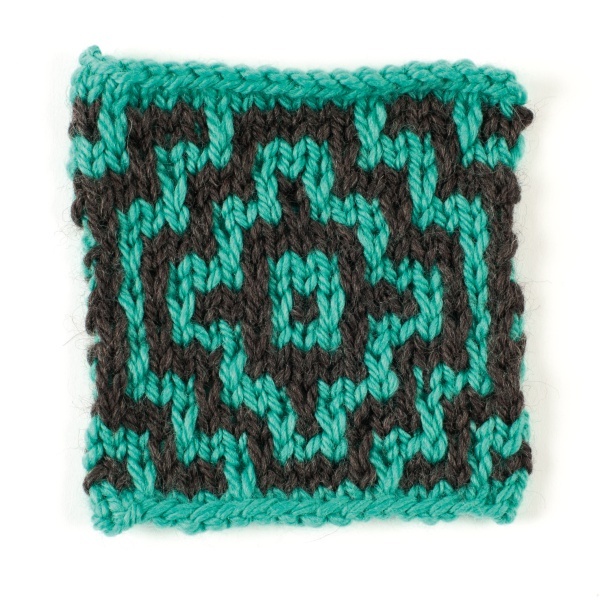 Everyone has heard about intarsia or Fair Isle, but whenever I teach a class in this technique, my students always ask, “Why haven’t we heard about this before?” Mosaic knitting is perfect for beginners who are attempting colorwork for the first time. If you’ve worked stripes in two colors, you can work mosaic knitting. Mosaic patterns are created by slipping stitches from the stripe below without working them. “Mosaic knitting” was coined by Barbara G. Walker in the late 1960s. Slipped stitches had been used before, but the prolific Ms. Walker took them to a whole new level. In her body of work (see Additional Resources), you can find hundreds of mosaic patterns as well as the knowledge needed to create your own mosaic designs. The technique is simple. Two contrasting yarns are used; for explanation purposes, we will say one dark and one light. 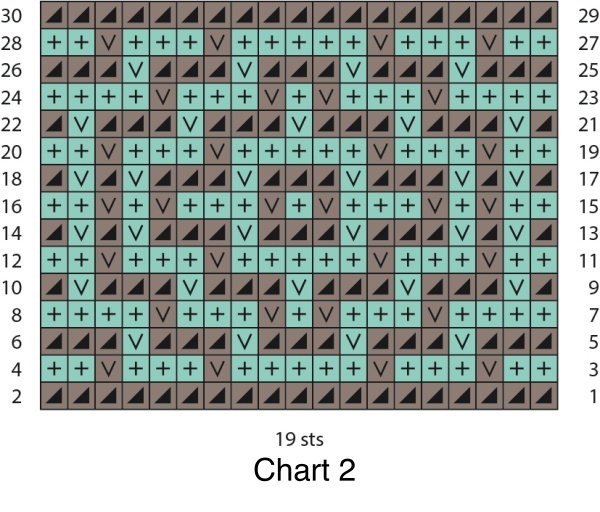 Chart 1 shows a motif of nineteen stitches. The selvedge stitch at each edge is always worked in the color of the stripe you are working. This means that you will never slip the first or last stitch of the pattern. Because this chart is worked in stockinette stitch, all right-side rows are knit, and all wrong-side rows are purled. On knit rows, reading the chart from right to left, knit the selvedge stitch using the color indicated, then knit all the stitches on the row that are the same color as the selvedge stitch. 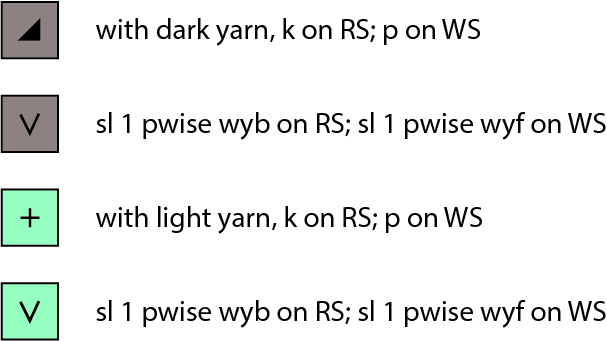 Slip the opposite-color stitches as if to purl, carrying the yarn in the back of your work (wyb) (Figure 1). On purl rows, reading the chart from left to right, purl the stitches that were knit on the preceding row and slip the opposite-color stitches as if to purl with the yarn held in the front (wyf) (Figure 2). A base stripe is worked in the dark yarn (Row 1 of the chart). On the next row (Row 2 of the chart), purl back. Now the fun begins! On Row 3, knit the selvedge stitch with the light color, then continue to follow the chart, knitting the stitches that appear as light, and slipping the stitches that appear as dark. On Row 4, purl the light stitches and slip the dark stitches. The next two rows will be worked with the dark yarn, slipping the light stitches. When switching colors, carry the new color up under the color just used along the edge of your work (Figure 3). There are a couple of ways to chart mosaic patterns. 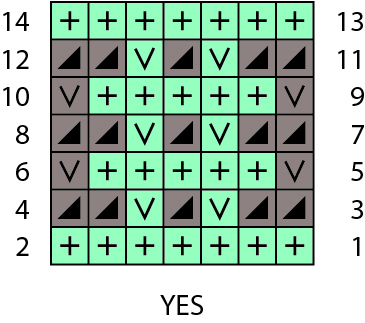 The method pictured in Chart 1 shows both right-side and wrong-side rows. 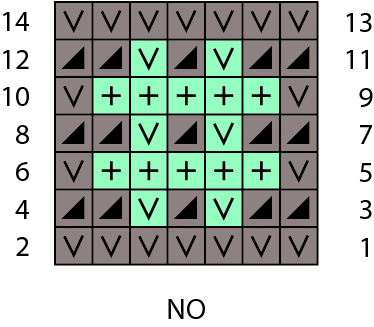 Another way to chart mosaics (shown in Chart 2) shows only the right-side rows. 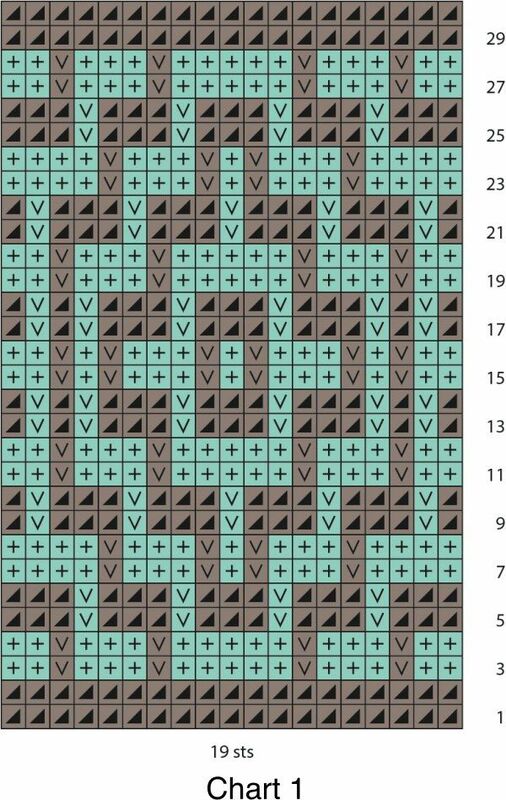 In mosaic knitting, the wrong-side rows are always worked by working and slipping the same stitches as on the previous right-side row, so it isn’t strictly necessary to read a chart for those rows. 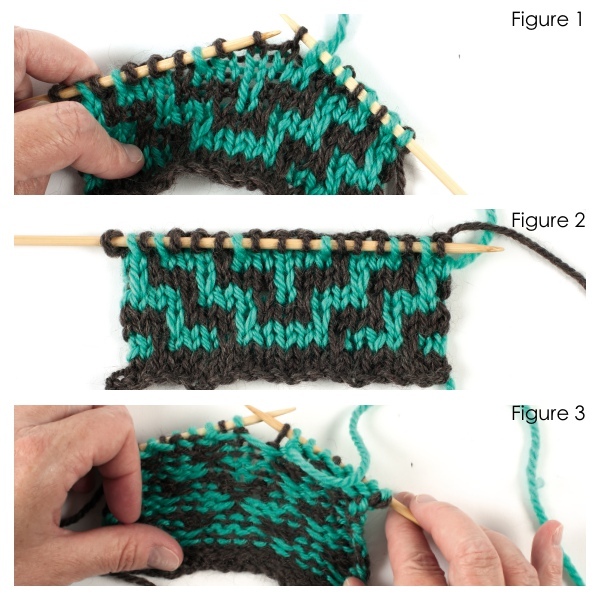 The first chart style can make it easier to keep track of rows as they are worked, but the second chart style better represents how the knitting will look as it is worked. When working from a mosaic pattern, be sure to identify the type of chart used in the pattern. If you are knitting in the round, the selvedge stitches should be eliminated. Each color is still used for two rounds, but all chart rows are read from right to left, with the yarn held in back when slipping stitches. When changing colors at the beginning of the round, be sure to twist the yarns to avoid a hole at the join. Also, placing a marker at the beginning of the round is crucial. I think of it as a speed bump—it slows me down so I don’t go too far! Mosaic knitting does have some limitations. 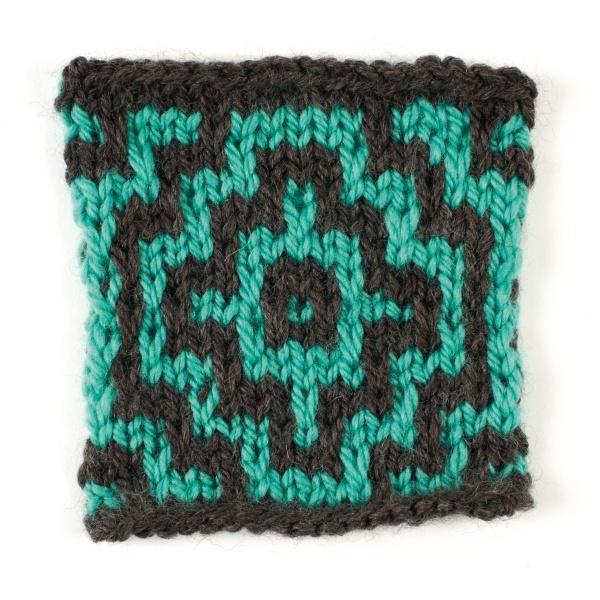 Unlike stranded knitting, a color can only appear in a row if there is a base color to pull up from below. Get out those colored pencils and graph paper and experiment! After you’ve come up with a couple of patterns, grab some scrap yarn and needles, and start knitting swatches. 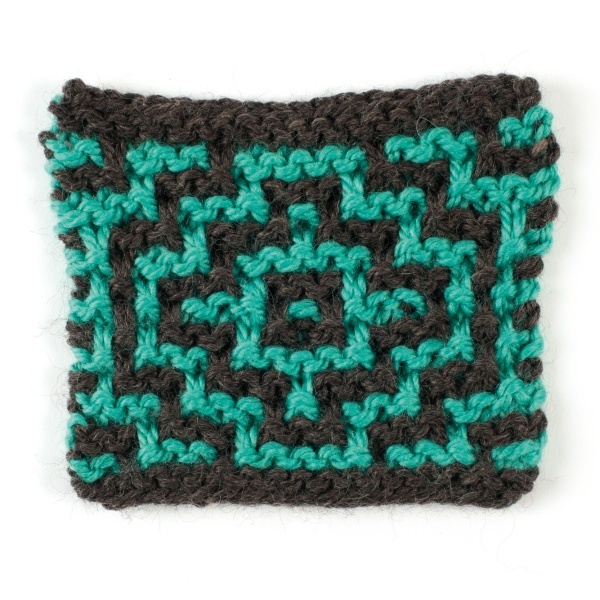 Washcloths are a great way to try out new patterns. If you don’t like them, delegate them to those really dirty jobs around the house. If you do like them, you can put them out for company! The technique of mosaic knitting lends itself to many applications. Try reversing the colors and see how it affects the look. What would happen if you used garter stitch instead of stockinette? A mosaic border on a simple sweater can really up the wow factor. How about combining stranded knitting and mosaics? Knit in the round to the armholes of a sweater, then back and forth in mosaic to the neck. Above all, have a little fun with your knitting and try something new! • Walker, Barbara G. Mosaic Knitting. Schoolhouse Press, 1997. • Walker, Barbara G. A Treasury of Knitting Patterns. Schoolhouse Press, 1998. • Walker, Barbara G. A Second Treasury of Knitting Patterns. Schoolhouse Press, 1998. • Walker, Barbara G. Charted Knitting Designs: A Third Treasury of Knitting Patterns. Schoolhouse Press, 1998. • Walker, Barbara G. A Fourth Treasury of Knitting Patterns. Schoolhouse Press, 2001. Ann McDonald Kelly lives and knits in Phoenix, Maryland. She can be found on Ravelry as annmckelly. 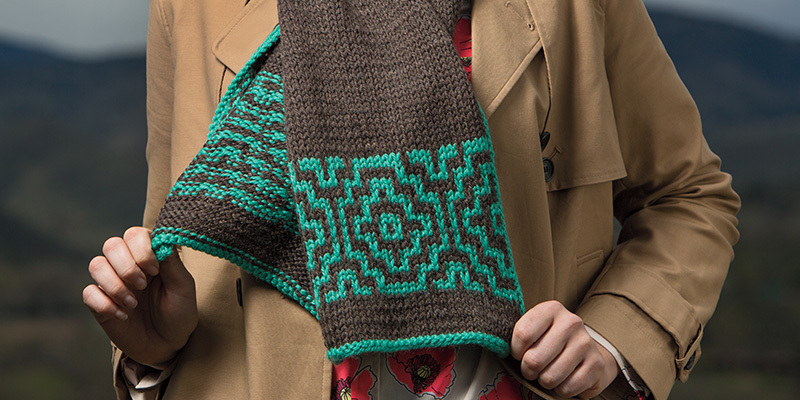 Check out her Neon Mosaic Cowl pattern from knitscene, Winter 2014! Find More Tech Tips in Our Magazines! Knit 101: We Have Cast-on!